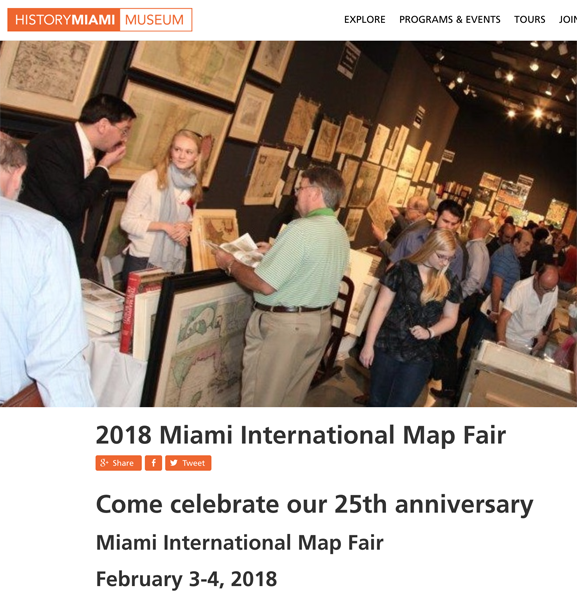 In February, the Miami International Map Fair turns 25! It is the longest running map fair in the world. We invite you to celebrate this anniversary with us. Immerse yourself in a world of exquisite antique maps, rare antiquarian books, and colorful atlases! Discover antiquities and more modern treasures presented by the finest map dealers around the globe. So say the folks organizing this year’s Miami event and I fully agree. Over what is expected to be a balmy weekend in Miami the first weekend of February, the 3rd and 4th, a very robust crowd of map lovers and cognoscenti will converge on 101 West Flagler Street for two days of repartee, browsing, listening, and transactions as beautiful maps are displayed, coveted, explained and purchased. This is an event that many look forward to as an excuse, if any is needed, to be in Miami when winter is digging in its claws into New England and the Midwest. The only difficult step to take is going home, although for dealers, many will quickly pack up and head to Pasadena, California, to their convention center, for the ABAA’s Fair. The winter season is under way. Here are the exhibitors after which are listed the show’s events. 5:30 pm – VIP Private Cocktail Reception and preview of Antillean Visions: Maps & the Making of the Caribbeanat Lowe Art Museum. This year, HistoryMiami Museum will not hold a VIP Preview on Friday at the Map Fair. Includes Friday and Saturday VIP cocktail receptions, Saturday 9 am VIP Preview, lunch, weekend admission for Dealer Marketplace, expert opinions and expert presentations.